SW Training has been providing high quality Fork Lift and MEWP training along with support services to local businesses, larger warehousing operations, and major blue chip companies since 2006. Our services are available to small and large materials handling clients, or to major online shopping clients. We also supply onsite training for many types of material handling training organisations that wish to engage our services for their clients or individual businesses. FLT Training Cardiff, Newport Swansea and Throughout South Wales. On Site Forklift Training And Mobile Elevated Work Platform MEWP Training for businesses across the following areas from an affordable flexible lift truck, cherry picker and scissor lift training service. At SW Training we supply the same standard of training as the major players within the road transport and materials handling sectors. The difference is that we offer the exact same services at far more affordable prices. We do not compromise on quality where your employees are concerned. All of our instructors are registered with the major lift truck training accrediting bodies in the UK and Ireland and are fully recognised by the Health and Safety Executive (HSE). Areas Covered By SW Training. Cardiff, Newport, Llantrisant, Swansea, Bridgend and Bristol. We also cover the west country and the west midlands. Not just Forklift Training in Cardiff SW Forklift Training Service offers highly qualified and fully certificated forklift trainers specialising in training your forklift truck operators at any location across Wales, The West Country, and The West Midlands. Onsite Forklift Training delivered by nationally registered instructors, our training is fully compliant with the HSE code of practice L117. We offer Forklift Training on our customer’s premises. Yes that means we come to you for all of your forklift training and MEWP training needs, This results in our prices remaining very competitive through the reduction in overheads, these savings are passed on to our FORKLIFT TRAINING UK and MEWP training customers. With our many years of experience within the materials handling sector we are able to offer many types of fork truck training on many types of machines, we have tried to list some of the more popular lift trucks below, however please feel free to call us regarding any type of lift truck training that you require, we really do believe that whilst out training costs are lower than many other forklift training agencies, we offer probably the best forklift training Cardiff and South Wales. It is also our view that we possibly offer the best Telehandler training Cardiff (Telescopic Handler Forklift) and throughout Wales and the West Country. (Scissor lifts and Cherry Pickers articulated and boom. Fully Compliant Fork Lift Training And MEWP’s Training. 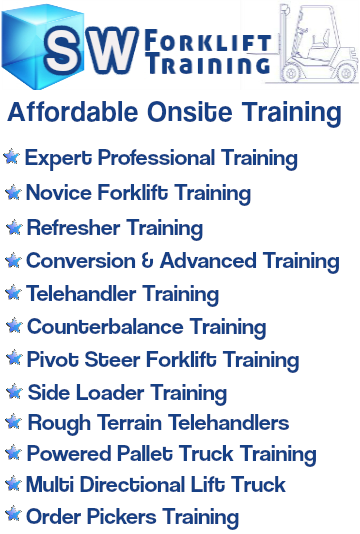 See our Forklift Training Services Page For Full Details Of Our Lift truck Training Services. MEWP’s Cherry Picker Scissor Lift and Forklift Training Cardiff. HSE Lift Truck Training Guidance. SW Forklift Training Cardiff On Site Forklift Training And Mobile Elevated Work Platform MEWP Training Covering Cardiff Newport South Wales The West Country and The West Midlands. SW Forklift Training Uk Forklift Truck Operator Training Specialist.